Water distillation is a form of purification that does not use reverse osmosis, deionization etc., but is used to remove almost all inorganic impurities, like minerals, from water. Filtration can only remove visible impurities from tap water and spring water, and can still contain varying amounts of invisible impurities that can either make you sick immediately or slowly over time. It doesn’t matter what the source is; water distillation can remove it all. The way it works is that water is heated to boiling point or more until it turns into steam and the impurities with higher boiling points are left behind, while the bacteria and other pathogens are killed because of the boiling. The steam then condenses and the pure water that is formed is collected in a separate container. If you think that distillation is the right method of water purification for your needs, then we can help you choose the best home water distiller that’s not as expensive as commercial models but works great for home use. Even though you can buy distilled water, it usually comes in plastic containers, which is not only unfriendly to the environment but also is not an ideal medium for holding water. Even though a distiller will cost more, you can recover its costs in about a year. As with all kitchen appliances, durability, warranty coverage and ease of use are important features to consider when buying the best distilled water machine. However, there are a few unique things you should also look out for. Because impurities are left behind, the best water distiller for home use needs to be easy to clean after at least a few uses. One way to do it is to use a residue cleaner dissolved in hot tap water in the boiler. Distillation is a slow process because water needs to boil first, then turn into steam and then condense back into pure water. Our best water distiller reviews only choose the models that are fast enough to make the process worthwhile so that you always have enough water ready to drink at any time. Because we’re talking about the purest form of water, it’s best that the steam and purified water doesn’t come into contact with materials like plastic or any corrosive material. Ensure that any components that do come in contact with the water are made of glass or high grade stainless steel. Since distillation does not remove volatile organic compounds (VOCs) that have boiling points lower than water, the best water distillers also come with a carbon filter section as well and the filters will need to be replaced regularly. You can find a generic brand of carbon filters online. If you’re more interested in just water filtration instead of distillation, take a look at our top picks for water filter pitchers. Now let’s find your ideal distillation model from the following home water distiller reviews. Megahome offers this countertop model in both white and black with stainless steel finishes. Both have a boiler and carafe capacity of one gallon. The most innovative part of the design is the stainless and glass construction. The interior is stainless steel and the water flows through a glass nozzle insert as it drips into the glass carafe via the activated carbon filter. The distilled water never touches plastic. The optimal distillation time of one gallon per 5.5 hours ensures removal of a wide range of contaminants. However, a few people have complained of a slight metallic taste to the water. This could be due to not cleaning the carafe or changing the filter as often as instructed. You will get 6 activated charcoal sachets with this distiller, which should last you about 6 months. You also get a small bottle of boiler residue cleaner. Both are easily available online. It’s a bit inconvenient that these two models are not programmable. The unit turns off automatically when all the water in the boiler is over and when the high temperature thermostat trips, but this causes impurities left behind in the reservoir to harden and burn, which shortens the life of the unit. Many who have bought these models turn the unit off when there is still a little water left in the reservoir to prevent this. You could always buy a cheap programmable timer like the type you would use to automatically turn a lamp off and on. The glass carafe should be handled carefully, as it will break if you drop it. If that happens, you can get a replacement. The Pure Water Mini-Classic CT Counter Top Distiller model is a bit pricey compared to the other models on this list, but it is made in the USA and is the best countertop water distiller to buy. The water processed in this model never comes into contact with plastic, a claim made by many distiller manufacturers even though some units usually have plastic carafe lids. The only plastic parts on this model are the switch, cooling fan, handle and a couple other parts that never touch the water. The rest is all stainless steel, except for the glass carafe. At a distillation rate of one gallon per 3.5 hours, this model is a bit quicker than most others. This can be useful if you use a lot of distilled water and want to store some so you don’t have to distill every day. Given the one gallon capacity of both the reservoir and the carafe, it would be possible to make four gallons of water in a day without having to pay too much attention to the machine. You will be thankful for the automatic shutoff feature too. This prevents a bunch of residue from collecting in the reservoir. You just pour off the water that is left after each cycle from the removable boiler instead of having to clean it too frequently. This unit features a preheating device that removes volatile organic compounds with lower boiling points than water and allows their escape through a special valve on the top. All of these extra features make this the best water distiller on the market. You may not find all of the features in this model that you would find in a more expensive option, but the CNCShop Water Distillation Purifier is a functional distiller at a fantastic price. The reservoir is made of stainless steel, but the collection container is plastic. Not ideal, but if the price point is important to you, then this is of great value. What you can do is purchase a separate glass container for collecting the distilled water. You will still spend less than the other models on this list. The rate of distillation, about one gallon per four hours, is comparable to other models. The capacities of the reservoir and carafe are also average, at one gallon each. This distiller is not programmable, but at least there is an automatic shutoff feature. This saves electricity and protects the unit from burning out, but it does cause a hard residue in the reservoir which must be cleaned out after every two cycles. You do get one packet of cleaning powder along with this unit. Overall, this is a great choice if you want a basic distiller without spending a fortune on it. The H2OLabs Stainless Steel Water Distiller is perhaps the best value among the higher priced distillers. VOC (volatile organic compound) removal seems to be an overlooked function among water distiller manufacturers. H2oLabs, however, is among the distiller manufacturers that are now tackling VOCs. An advanced carbon filter located in the spout removes nearly all VOCs. People who have bought this model love that fact that the water never touches any plastic. The reservoir and condenser coil are stainless steel, and the spout and carafe are made of glass. The average speed of most distillers seems to be around one gallon per four hours. This model is a bit slower because the heating element is not as powerful. The company claims that they sacrifice speed in this way in order to prevent VOCs and other contaminants from boiling over into the carafe along with the purified water. This makes sense, although there is no scientific evidence that it works in this way. 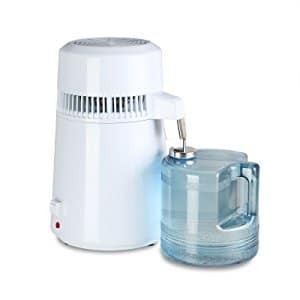 The one gallon reservoir capacity of this model is unremarkable, as is the non-programmable automatic shutoff feature, but this is one of the best among the higher priced models and you also get a large quantity of cleaning crystals and a year’s supply of activated carbon filters. The Olizee Pure Water Distiller is another great value machine. This is a basic distiller at a fair price. Fill the one gallon steel reservoir, flip the switch, and four hours later you will have a plastic carafe full of pure distilled water. Of course, you can and should replace that plastic carafe with a glass container, but the open design of this model makes it easy to find a replacement. You can even use an old or new coffeepot carafe, but it would be much better to get a collection container with a lid so you can also use it for storage. This unit features a thermal overload protection device for safety and an auto-shutoff for when the water in the reservoir completely boils off. To prevent hard scales forming to quickly, you could use a timer and switch it off after 3.5 hours and throw away the remaining water left at the bottom.